Challenge: With its beautiful scenery, historic towns and unique cultural attributes Southeast Alaska is a world class tourism destination for cruisers and adventure travelers alike. But the national recession has dealt the region a serious blow over the past three years. Tourism leaders decided to take advantage of the crisis to mobilize their stakeholders and industry leaders and move into the improving economy with new tourism offerings, new marketing initiatives and new partnerships. Solution: Working with an ECG economic development expert (Lyman), these leaders established a Tourism Cluster Working Group. Drawing insight from a penetrating economic analysis funded by the U.S. Forest Service, they began meeting to discuss the critical issues and opportunities afforded by the economic downturn, identify new actionable solutions to some of the most pressing issues and launch implementation activities. Results: In the first few months of the effort, the industry secured a consensus among stakeholders on the most critical issues, prepared business plans for addressing them and took steps to implement six specific efforts. Funding for some comes from the U.S. Forest Service, others are funded locally. While the effort is only a couple of months along at this time, the results are already being seen in the mutual enthusiasm of local stakeholders and potential funders. ECG was retained in 2009-10 to deliver the Alaska Comprehensive Economic Development Strategy (ACEDS), Phase 1: Situational Analysis. Challenge: In 2009, Alaska was faced with a one dimensional economy—natural resources-- at a time when demand for the products and services of other reasonably strong sectors at the time—tourism, sea food—were being hit hard by the national recession and long-standing sectors—forestry, boat building—were in very steep decline. Leaders knew that a fresh look at the economy, updated forecasts, and new ways of thinking about economic development were necessary. Solution: ECG's economic analysts and economic development strategy experts were retained in a highly competitive selection process to take on the challenge. We designed a project of two phases, the first was to produce a comprehensive situation analysis and the second to mobilize state leaders and go to work, cluster-by-cluster to identify critical issues and to go to work with new public policies, new public-private partnerships and new institutional reforms to revitalize the state's economy. Bringing the best of the ECG family into the effort, the economic experts in ECG were linked up with the oil and gas experts of ECG CERA (Cambridge Energy Research Associates) to develop the assessment. Analyses were made of the current economic situation, forecasts for oil and gas, comparative benchmarks, and the capacity of the state's economic development organizations to tackle the challenge. Results: Alaska is now using the Situation Assessment to mobilize and inform the efforts of cluster working groups being implemented across the state. They include: Tourism, Trade and Logistics, Forest Products and Alternative Energy. Each group is moving forward with actionable solutions, soon to be woven into a state strategic plan for economic development that is already being implemented at the regional level. Overseeing this effort is the Alaska Forward Leadership Council made up of top business leaders, the president of the university and the executive team of the state department of economic development. In 2009, one of ECG's consultants advised the East Bay Green Corridor Partnership (San Francisco Bay Area) on strategies to improve the region's position in clean technology and renewable energy technology development. Challenge: The East Bay Green Corridor Partnership, a partnership of the University of California - Berkeley, Lawrence Berkeley National Laboratory, 8 East Bay cities, and 2 Community College districts wanted to build on the region's existing strength as a center for emerging green technology, innovation and entrepreneurship. Solution: As a consultant to the East Bay Green Corridor Partnership, ECG expert, Elizabeth Redman, identified relevant private sector companies and facilitated roundtable discussions with industry leaders from five green technology sectors. Based on both quantitative research and industry input, she created a roadmap for improving the region's market share in green building, energy efficiency, environmental consulting, recycling and solar energy. Results: The East Bay Green Corridor has implemented several of the recommendations, such as streamlining the solar permitting process across cities, launching a trade association for the residential energy efficiency industry, and collaborating on workforce development. The East Bay continues to be one of the leading areas in the U.S. for green jobs. Working with the Oregon Business Council in Portland, Oregon, ECG helped the state to develop a sustainable economic development strategy to leverage Oregon's "green" reputation and focus on strengthening connections between Oregon's traded sector clusters and community, academic, and government leaders. With help from Oregon's trade associations, former Oregon Governor Kulongowski, the Oregon Economic and Community Development Department, and the Oregon Innovation Council, ECG helped shape the 2008 economic development agenda for the joint public-private Oregon Business Plan. In order to identify statewide industry priorities and challenges, ECG staff conducted focus groups with Oregon's key industry cluster leaders. In addition to identifying their primary obstacles and opportunities, this process encouraged each cluster to think about their definition of sustainability and the ways that the industry could leverage Oregon's "green" reputation. The feedback from the focus groups is summarized in the 2008 Cluster Resource Guide and interviews with key Oregon sustainability and business leaders resulted in the Oregon Business Plan's adoption of 4 new sustainability initiative proposals. ECG also helped organize the cluster roundtable discussions that were a major focus of the December 3, 2007 Oregon Leadership Summit, which takes place annually. The Summit drew over 1,000 business, elected and community leaders to discuss the Oregon Business Plan's strategy for supporting Oregon's traded sector clusters and presented 17 industry cluster roundtable sessions where key leaders from the public and private sectors came together to build new relationships and advance cluster-specific action initiatives. ECG also facilitated the Oregon Cluster Network to encourage cross- cluster and cross- sector connections. Click here to learn more about the Oregon Business Plan and Oregon Cluster Network. Building on the recommendations made in ECG's 2003 Targeted Industries Study, Marin County has hired ECG to develop a model of Economic Sustainability for the region. Marin's long-standing commitment to the environment, equity, and the economy is reflected by the Countywide Plan, approved in November 2007 and awarded the American Planning Association's 2008 National Planning Excellence Award for Sustainability Program Implementation. By focusing on engaging business, community, and government leaders in a collaborative economic development process, ECG helped the region to create an economic strategy that reflected Marin's environmental and cultural values. One result of the project was a new "Food & Farm Experience" cluster that fleshed out opportunities for Marin to develop its agri-tourism industry. In May, 2007, Oakland Mayor Ron Dellums launched The Oakland Partnership, a public-private collaborative effort focused on Oakland's economic development. The goal of the Oakland Partnership was to create a thriving, innovative, equitable, globally competitive regional economy that creates 10,000 new jobs in the next five years by tapping into the creativity and talent of all segments of the population and providing benefits to all Oakland residents and businesses. Building from a study conducted by McKinsey & Company to establish a clear picture of the current state of Oakland's economy, its relative competitiveness and attractiveness, and the issues hampering economic growth and continued improvement in the City's quality of life, the Oakland Partnership hired ECG to facilitate the process of convening four key industry clusters: Trade & Logistics, Healthcare & Life Sciences, Green Technology, and Art, Design & Digital Media. Beginning in May 2007, ECG helped the Oakland Metropolitan Chamber of Commerce and Mayor Dellums' Office to organize a broad-based group of companies, educational institutions, government representatives, labor leaders, and community members around each of these key industries. The four cluster working groups were business-driven and resulted in measurable action. With ECG's help, each cluster identified top priorities, strategies for the sector's growth, and today continues to implement between 5-15 action initiatives that enhance the cluster's competitiveness. 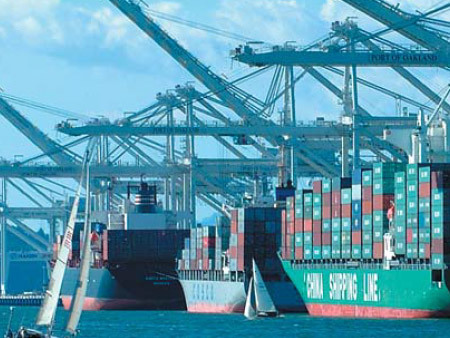 In July 2004, the Puget Sound Regional Council engaged ECG to undertake the development of the first-ever Regional Economic Strategy for the Central Puget Sound Region with an overarching goal to create 100,000 new jobs. The Puget Sound region economy's considerable dependence on the aerospace and information-technology sectors was exposed by the bursting of the internet bubble and subsequent economic downturn. At the time, this ongoing strategy was a bold new initiative that set an agenda for what was needed to ensure that the Puget Sound regional economy flourished in the future. It was the first time that government officials, community advocates, and business leaders from King, Pierce, Snohomish, and Kitsap counties agreed to collaborate on a comprehensive regional economic development vision. ECG performed economic analysis and lead a collaborative, cluster-based strategy process engaging a broad range of participants from the public, private and non-profit sectors to develop a common vision for the region's economy and to focus on key components of it, including identification of important and emerging sectors and steps that should be taken to support and grow them. During this process, ECG facilitated Cluster Working Groups with the Aerospace, Clean Technology, Information Technology, Life Sciences and Trade & Logistics clusters. As an extension to its highly successful Business and Workforce Assessment Study, ECG was retained by the County of Monterey to perform benchmarking analyses and readiness assessments of each of region's key clusters. ECG has supported the County in undertaking a cluster marketing effort, branded as the "C 2" initiative that has been executed jointly with the Monterey County Business Council and representatives from firms in each of the major clusters. The clusters, and the cluster development initiative, are being promoted externally to neighboring states and regions, as well as internally, to ensure unified support for the effort amongst Monterey residents. Originally, the project involved Monterey's three clusters: Agriculture (including wine), Tourism and Research and Education. These clusters are the county's major drivers of economic growth and employment. This initiative, now moving into its third year, has brought hundreds of private and public sector leaders together around a new, shared economic vision for the County. A four-part economic development strategy guides the "Competitive Clusters" initiative and twelve concrete action initiatives are moving the project from design to implementation. In January 2004, ECG completed a five-year economic development strategy for the County of Sarasota, FL. The ECG team launched the project by authoring an Economic Profile detailing business climate conditions within the County. Using the Profile as a spur to additional public dialog and communication, the team facilitated a series of more than 30 focus groups, cluster groups, regional forums and one-on-one interviews across the County, culminating in a countywide Economic Summit that drew an audience of more than 200 stakeholders. The strong support voiced at the Summit for expanding and developing Sarasota's value-added clusters served to validate the County's decision to use a cluster framework for its Economic Plan. Starting in June 2003, ECG was tasked with developing a set of economic, social and environmental criteria that helped Marin County to evaluate which types of industries should be encouraged, or discouraged, using a variety of policy instruments available to the County. Using these criteria, the team developed a list of nine target industries that met these criteria. ECG used a multi-pronged approach to meet this study's requirements. The methodology included: conducting a review of economic trends and other factors that had an impact on business location decisions; undertook a cluster analysis, identifying the underlying drivers of the region's economy; conducted interviews and focus groups and with community leaders and business owners and executives; developed a list of target industries (grouped by industry clusters), that were consistent with the criteria; and prepared recommendations the Marin Economic Commission consider as it shapes its vision for Marin's economic future. These recommendations were in turn, submitted to the County Board of Supervisors and are currently under consideration for incorporation into the Countywide Plan. The County of Monterey, CA engaged ECG to perform a year-long study of the dual foundations of the region's economic health: business climate and workforce readiness. ECG used a variety of economic and social analyses, preliminary cluster identification assessments and focus groups to determine whether the County's major industries, its business climate policies and its workforce development infrastructure were aligned with each other (and with the macroeconomic trends that will affect the region in coming decades). Starting in August 2000, ECG conducted a 10-month, highly collaborative strategy review process, commissioned by Kansas, Inc., the public/private agency responsible for strategy development in the State of Kansas. Along with Cambridge Systematics, Inc., ECG conducted a baseline analysis of the Kansas economy, compared basic indicators for economic foundations against reference states, and evaluated the key economic development institutions. ECG utilized major portions of five major conferences to obtain stakeholder input, conducted dozens of interviews and focus groups around the state, and held six cluster working groups to engage top leaders in aerospace, advanced materials, value-added agriculture, biotechnology, IT/telecom, and energy. Business, government and academic leaders identified during this process have been essentially integrated into the consulting team to provide a comprehensive, well-supported set of strategies and specific action initiatives. For the California State University Chancellor's Office, ECG has conducted a feasibility study for a multi-use biotechnology facility that is designed to help launch the biotechnology cluster in the Los Angeles region. The focus of the project was to establish a more favorable environment for Caltech-based spin-offs, which have been migrating to the more vibrant San Diego and Silicon Valley clusters once they learn how difficult it can be to find trained staff, wet lab space, and entrepreneurial services near Caltech. ECG assembled a unique coalition of teaching universities, researchers, and private sector leaders to design and launch this biotechnology center. The feasibility study includes an overview of the biotechnology market nationwide, profiles of specific biotech clusters and best practices for technology commercialization and innovation, a SWOT analysis, a needs analysis (including a survey of existing firms), and financial and organizational recommendations for launching and operating the center. During 1999-2000, ECG was asked by the Governor's Office to conduct a cluster analysis of the state, focusing on Louisiana's Vision 20/20 and the six high technology target clusters that were identified in that vision. ECG validated the cluster selection, developed a state-wide cluster development strategy, integrated existing economic development programs throughout the state, and evaluated the Department of Economic Development in terms of mission and effectiveness. ECG conducted six cluster meetings, covering 1) Information Technology, 2) Bio-Medical, 3) Food Technologies, 4) Advanced Materials, 5) Micromanufacturing and 6) Environmental Services, and developed strategies for each cluster, as well as a less detailed cluster development plan for each of the 9 established clusters. The project involved a series of stakeholder meetings for each cluster, facilitated by ECG staff. For the Westchester Economic Development Partnership, ECG conducted a 1999 cluster analysis of Westchester County, and developed an action plan and marketing strategy. The team facilitated cluster working group meetings for most major clusters, and made recommendations for re-organizing county government in order to deliver economic development services more effectively. As a county with a high concentration of Fortune 500 corporate headquarters, including IBM, PepsiCo, MCI, Phillip Morris, Texaco, Prodigy, and Ciba Specialty Chemicals, the team identified a HQ and SME Corporate Services Cluster, organized to serve the specialized needs of headquarter operations, both large and small. The need for better-organized conference facilities, R&D labs, and telecommunications infrastructure became apparent when this key cluster was identified, and the expansion of small and large headquarters became a goal. The need to coordinate county policies with key initiatives taking place at the municipal level was a prominent feature of the final strategy. ECG facilitated three major stakeholder meetings of community leaders and public officials. 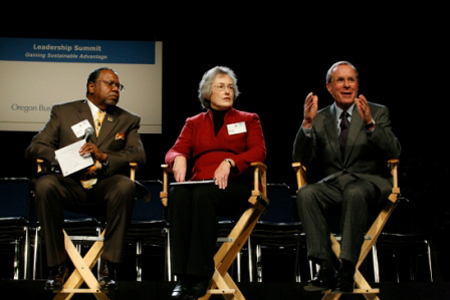 In 1998, El Paso engaged ECG facilitation of a unique economic summit in which major area politicians requested more focus from the private sector in terms of economic development initiatives. With Standard & Poor's DRI, ECG updated the cluster analysis and overview of the El Paso economy, and presented these results at the 2-day Summit. The Summit engaged over 150 participants, and featured a community vision, along with specific strategies to achieve the vision. During the summit, a remarkable consensus was forged as to the priorities of the community, in terms of four primary initiatives and four secondary initiatives for economic development. At the end of the summit, the Mayor, County Judge, State Senator and U.S. Representative all publicly signed their names to the final strategy document, expressed their commitment to implement the initiatives. ECG was asked to identify Pennsylvania's clusters, both on a state and regional level, and indicate which emerging or "high-tech seed clusters" might be the best candidates for attraction and retention programs. The study not only mapped the Commonwealth's cluster structure, but also the underlying technological capabilities in Universities, research centers, training programs and private R&D labs. The cross-mapping of established clusters, seed clusters and technological capabilities provided a powerful lens for government and private sector leaders to focus on the leading drivers of the economy in the future. For the Indiana State Chamber of Commerce, ECG recently completed a major study describing the factors underlying the success of small business communities at global level. The study included an extensive literature survey of successful regions, and in-depth case studies of six selected regions: West Jutland (Denmark), Cambridge (UK), Catalonia (Spain), Silicon Valley (CA), Minnesota (MN), and Research Triangle Park (NC). The study focused on "best practices" — activities and programs set up by public, private, or mixed sponsors to assist small enterprises, and on identifying the underlying "stories" behind the success of each individual case. The study concludes with an analysis of the underlying principles of creating and sustaining dynamic small business communities, along with specific recommendations for the State of Indiana. ECG was hired by the North American Development Bank (NADBank) to plan and facilitate a collaborative planning workshop for a major meeting of the Border Environmental Cooperation Commission (BECC), NADBank, the Commission Nacional de Agua, the International Boundary and Water Commission, and the US EPA. The workshop brought together the executive leaders and staffs from each of these organizations. In this meeting, the main objectives were to identify barriers to progress and reach consensus on an action plan for success. A secondary objective was to build a collaborative team of all groups and improve communications and trust. The three-day workshop, which engaged simultaneous meetings for 50 participants as well as breakout groups, produced an action document that outlined consensus on goals, roles, and actions. An action plan was put together defining specific roles and responsibilities for collaboration among the different organizations in the upcoming year. ECG in collaboration with DRI/McGraw-Hill, conducted an analysis of the South Texas-Northern Mexico economic region to estimate the demand for air passenger and cargo transportation in the Lower Rio Grande Valley. ECG worked with local business leaders, officials, and airport managers in carrying out this project. The America's Clusters Report presents the work ECG completed in 1996 for the United States Department of Commerce, Economic Development Administration (EDA) to identify and analyze America's industrial clusters. ECG, then a division of DRI/McGraw Hill, profiled cluster-based economic development projects completed regionally by states, regions and communities in the United States, and included in this report the key lessons learned in the process of initiating these efforts. Through the America's Clusters study ECG additionally identified three essential tools for cluster leadership to effectively administer cluster development and implementation in creating competitive advantage. Those tools are: an emerging new logic for regional economic competitiveness, the application of best practices/case studies that illustrate how regions have approached and applied this new logic, and integration of lessons learned from successful clusters around the nation. The America's Clusters report has become a standard primer for cluster development initiation efforts. ECG led a multi-disciplinary team to develop the MBEST center. This study articulated the nature of market demand that, in turn, determined the MBEST Center concept, its physical design, and implementation strategy. 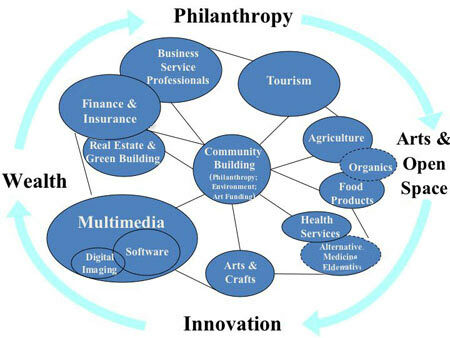 A complementary approach was to understand the mix of industries, institutions, and organizations in the region that could be mobilized to pursue identified market opportunities. ECG conducted detailed market niche studies tied to concrete action-oriented marketing plans for each of four clusters. We were asked by California State University Long Beach to develop a conversion strategy for the Cabrillo Army base. The approach used here was to analyze the surrounding industry clusters in Long Beach and Los Angeles and determine their status, growth and requirements for expansion in the region, then use their requirements to shape a research and technology park complex that would leverage the core competencies of the University. The project provided an economic rationale and design for development of the converted base facilities to new uses. This plan is now being implemented, and ECG went on to design components of the park being developed. In addition, ECG developed the first cluster analysis of the City of Long Beach, and demonstrated how their cluster structure sets the stage for future economic development investments. In a follow-up study with Long Beach we are helped to design a demand-driven regional business incubator that utilized ECG's approach of avoiding "physical" incubators when not necessary and emphasizing "virtual" incubators wherever possible to accelerate enterprise formation by overcoming market gaps in business services, market information, technology "downstreaming", production partnerships and financing. In 1994, when ECG was a unit of DRI/McGraw-Hill, ECG assisted El Paso through a 12-month economic strategy process. A Steering Committee was formed, along with working groups covering the seven major industrial clusters in the region. With major support from the two largest chambers of commerce, and institutional support from UTEP's IM 3, the project defined a series of strategies and initiatives at the cluster level, county level, and cross-border level (Camino Real Corridor). The resulting Action Plan defined a vision and a series of steps to be taken at the level of the County and City of El Paso, but some of the key institutional recommendations have yet to be implemented. ECG staff members, then working with SRI International, supported the Arizona Strategic Planning for Economic Development (ASPED) project--the most comprehensive, participative state-wide planning project ever. In Phase I, completed in April 1991, a Strategic Assessment of the Arizona economy was conducted. The team undertook a competitive assessment of Arizona's current economic position and identified strategic opportunities to develop economic clusters and economic foundations. The document, " Arizona at the Cross-roads: Strategic Assessment," served as the baseline document for the Phase II strategic planning process. Through working groups, town halls, and public forums, this planning process involved a broad cross section f Arizonans in setting priorities and developing specific initiatives for Arizona's economic development. The Arizona project today remains active with more than 12 cluster working groups. At the request of the Florida Chamber of Commerce, the professionals from ECG (then at SRI International) worked to identify strategic directions for how Florida can build a leadership economy by promoting the growth of new enterprise. Enterprise Florida focused specifically on new enterprises that can capture added income for the Florida economy. The report evaluated the growth of new enterprise within several emerging industry clusters: laser/electro-optics, health technologies, information, and space industries. The team formulated a strategy and action plan from which the public and private sectors can encourage the growth of industrial clusters to create the higher‑value‑added economy of Florida's future. Several Florida communities have utilized Enterprise Florida in developing regional strategies. In 1996, the team updated and benchmarked the progress in Florida for the Chamber. In a set of projects, the ECG team (with DRI and SRI) examined the underlying economic dynamics of the Southern California economy from three perspectives--historical, regional, and industrial--to help identify opportunities for the regional utility to affect the economic future of the region. Four major clusters were identified and the linkages between them were examined in detail: aerospace, advanced manufacturing, and process industries; diversified manufacturing; advanced services (business/ financial, health services, tourism/entertainment); and agriculture and food processing. The report discusses a number of important roles the client can play through its own activities and through cooperative efforts with other private firms and public agencies to promote critical public actions that will help build stronger industry linkages and promote economic infrastructure. The regional utility has used the study to help identify new business opportunities as well as to take action in enhancing the overall long-term economic growth of the region. The state of Minnesota, as part of the Lake Superior Initiative, asked the professionals, now with ECG, to prepare a conceptual plan for an Institute for Lake Superior Research (ILSR). The mission of the proposed institute is to develop the research and knowledge base necessary to guide policy decisions to maintain the environmental integrity of Lake Superior. The ECG team identified the resources available to address research and information-transfer needs for ensuring the ecological integrity of Lake Superior. The ECG team also proposed an administrative and management structure for development of scientific research and information transfer on Lake Superior. This project provided the Illinois Coalition and the Illinois Department of Commerce and Community Affairs with an assessment of the needs of small to mid-size manufacturing firms for modernization. Through a series of focus groups and a survey, ECG provided a written report of the needs for technology, equipment, and process by these manufacturing firms as well as recommendations on how the State can best serve this business group to compete in tomorrow's markets.